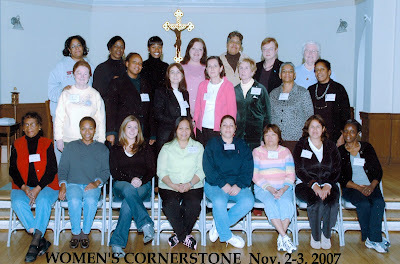 Pictured: Women's Cornerstone Team and Candidates, November 2007. Another development was the introduction of the Cursillo movement to the parish in 1967. A layman named Eduardo Bonnín participated in the early years of the "short courses" in Mallorca and helped develop the Cursillos to the point that it became an active renewal movement in the Church. The Cursillo method focuses on training lay people to become effective leaders over the course of a three-day weekend. There was an emphasis on preparing Cursillistas to take the movement's methods back into the world, with meetings that kept the spirit of Cursillo alive. By 1981, almost all of the 160 dioceses in the United States had introduced the Cursillo Movement. Cursillo is still prominent in 2008 at St. Anastasia’s; the most recent Lay Director for the Archdiocese was parishioner Kathy Glowski. In 1995, Cornerstone as a parish experience started with Sr. Adrienne Bradley, S.S.J., Faith Formation Director at St. Anastasia’s. She first made a Cornerstone Retreat at St. Joseph’s, Oradell, NJ. The preparation under her direction included forming the teams and preparing the site (the school building) for a night and a day. Women’s Cornerstone Retreat was first held here in October 1996. The first Men’s Cornerstone here took place within the month. Other practices that have helped parishioners develop in groups are Renew (small group meetings during Lent in a parishioner's home, using guided discussion and liturgical readings), and Spirituality Days for Men, and Spirituality Days for Women.